Ironically, iron and manganese are less likely to be present at levels that could be damaging to your health, and yet they’re more likely to leave clues that they’re present. That’s because iron and manganese can both cause staining to clothes and fixtures. As for the rest – bacteria, radon, arsenic, and uranium – they don’t affect the taste, colour, or odour of your water, so knowing whether or not you have a problem is impossible without a water test. It’s important to note that the health impacts for most (bacteria are the exception) aren’t immediate – it’s long-term consumption of the water that can develop into serious health concerns. For instance, drinking water with even low levels of arsenic over many years can lead to increased chances of lung, liver, skin, and bladder issues. With bacteria and other microbes, the effects are likely to be felt fairly immediately – often within a day or so of drinking the contaminated water. Infections from bugs like E. coli, Cryptosporidium, Giardia, and water-borne viruses generally cause gastrointestinal symptoms, including abdominal cramps, diarrhea, nausea, and vomiting. It’s easy to dismiss these as the result of something you ate or even a flu bug, though.. But if you don’t consider the possibility that it was the water, you run the risk of it happening over and over again. With a simple water test, you can confirm whether or not your well water is the problem and then take steps to fix it. Other contaminants that can be found in well water include pesticides, nitrates, or volatile organic compounds (VOCs) such as benzene. These are the result of human activities and may be more localised. Once you have a current water test, speak with a KK water treatment professional for help interpreting the results and determining which water treatment equipment can keep your water safe. 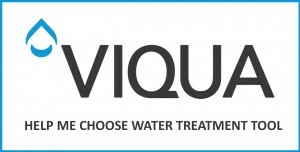 You can check out Viqua’s Help Me Choose tool, we are Viqua’s exclusive distributor in the UK.